From fun centerpieces to activity mats and beyond — this Thanksgiving, set a kid’s table that’s so cool you’ll want to sit there yourself! If you don't already have one, first pick the perfect pint-sized table to entertain your little ones this Thanksgiving. 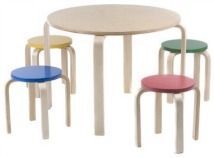 This Guidecraft Color Nordic Kids Table and Chair Set is a great choice because of its smooth ouch-free edges and convenient stools that can be stacked or stashed under the table when you're not using all four chairs (Zoostores.com). It's made of natural bent wood and the color-topped stools add the perfect pop of fall color. 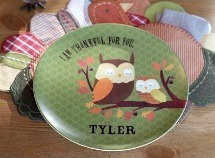 Consider splurging on a personalized keepsake that you can use each year, like these Thanksgiving plates with your child's name on them (Pottery Barn Kids). These sweet little 10-inch dinner plates are BPA-free and feature adorable owls and a meaningful message that lets your little one know just how special you think they are. 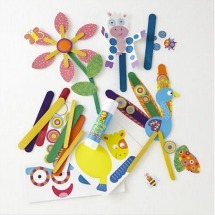 Keep the kids entertained while you wait for dinner with this cool pop-stick craft kit (The Land of Nod). They can create seven pop-stick projects with one kit — from a colorful peacock to silly little cow puppets. It includes pop sticks, stickers, shapes, a glue stick and simple instructions to foster creativity while keeping the kids content. You can even start a new family tradition by sending the craft each child makes home with their parents, tied with string and ready to be hung as a homemade ornament for Christmas. 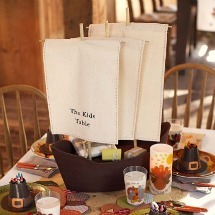 This adorable ship centerpiece, inspired by the Mayflower, is the perfect table-topper for kids. You can fill it with festive fall decor like leaves and pinecones, craft materials or even dinner rolls. This ship makes a serious statement with three large canvas sails and stands nearly 2-feet high (Pottery Barn Kids). 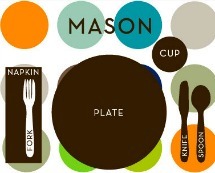 These modern placemats are a great addition to any Thanksgiving table. 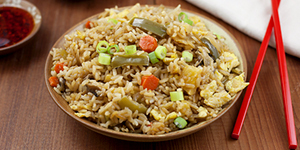 On one side, the mats have markers for a plate, utensils and a little cup, so your kids can practice place-setting. On the flip side, kids can write in what they did that day and even draw a photo describing their Thanksgiving adventures (Name Your Design). 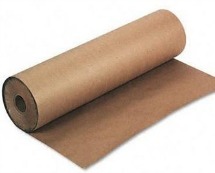 Before you set your final table, cover it with Kraft wrapping paper (Paper Mart). The brown paper tone is on-theme with Thanksgiving, it saves your table top from run-on crayons and it can double as a craft project since the kids can trace their handprints, color their names and even paint across the top of it... without sacrificing your table.